This blend of dark and green leaved plants is just right and the mix contains all the flower colours currently available in the semperflorens type. 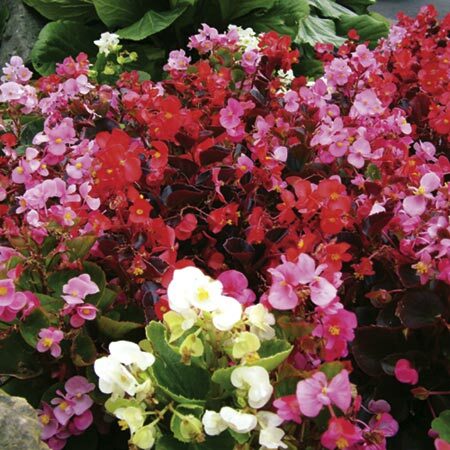 Add to this the plant vigour and early flowering and it's a clear winner!" Height 20cm (8"). Flowers June-September. HHA - Half hardy annual. For bedding, patio containers or baskets. The perfect choice for all kinds of weather. Sow January-March to flower June-September. Ideal for beds and borders, patio pots and containers. Prefers full sun or partial shade. Toby's Tip: Begonia seed is like dust and needs light to germinate, so it needs sowing on the compost surface. We cover with a thin layer of horticultural vermiculite to create water vapour round the seed and aid germination.